Villa Sofia can accommodate up to 10 people. It consists of a kitchen equipped with dishwasher, oven, microwave and crockery TV LCD, WIfi, 3 bedrooms, 2 bathrooms, terrace for outdoor dining, garden and swimming pool for exclusive use . It is immersed in the Monferrato hills cultivated with vines for the production of fine wines such as Barbera, Asti Spumante, Barolo and Barbaresco. The production of Piedmont IGP hazelnuts is also excellent. 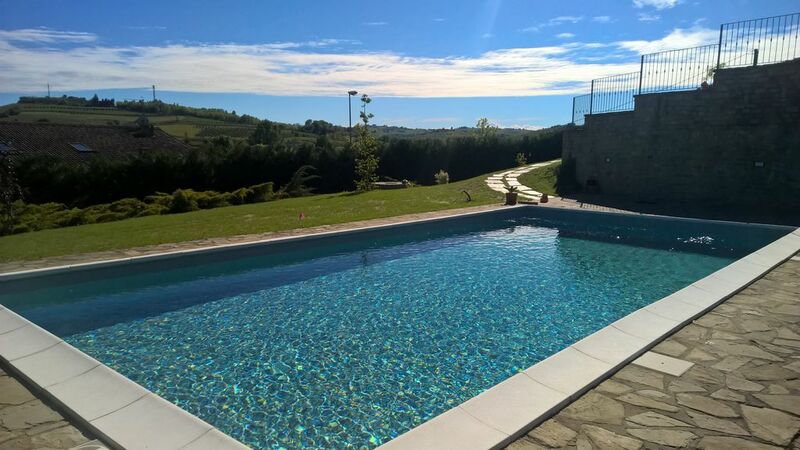 You can relax by the pool and organize excursions on foot or by bike through the hills or visit the many ancient villages and castles in the areas of Alba, Canelli, Nizza Monferrato, nearby there is a beautiful spa with wellness center. Within walking distance you will find an excellent spa with wellness center. A holiday between Langhe and Monferrato can be a pleasant wellness break, alternating with opportunities to keep fit and to immerse yourself in nature rediscovering the pleasure of a simple walk in the countryside. a few kilometers away you can find a luxurious SPA built in an ancient monastery in Santo Stafano Belbo, a relaxing Hammam in the heart of Alba the city of truffles. You can rent bicycles or take walks in the vineyards. Nearby you can book excursions in quod or horseback riding. Near MOntaldo Scarampi there are many wineries where you can taste famous wines. Canelli is the city of sparkling wine that hosts the cathedrals of wine, UNESCO historical underground subterranean cellars. In Santo Stefano Belbo you can visit the places described by Cesae Pavese in his famous novels and poems. A few kilometers away you can visit the city of Asti rich in history and culture. Turin and the Ligurian Riviera with its beautiful beaches are also nearby.